The geomagnetic field was quiet on October 22. 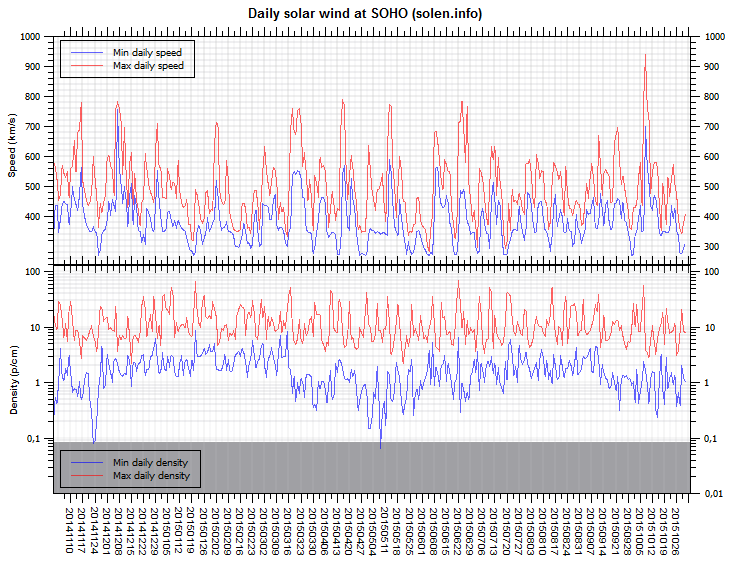 Solar wind speed at SOHO ranged between 357 and 471 km/s. 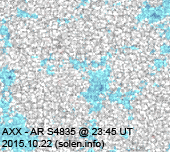 Solar flux at 20h UTC on 2.8 GHz was 120.5 (increasing 0.7 over the last solar rotation). 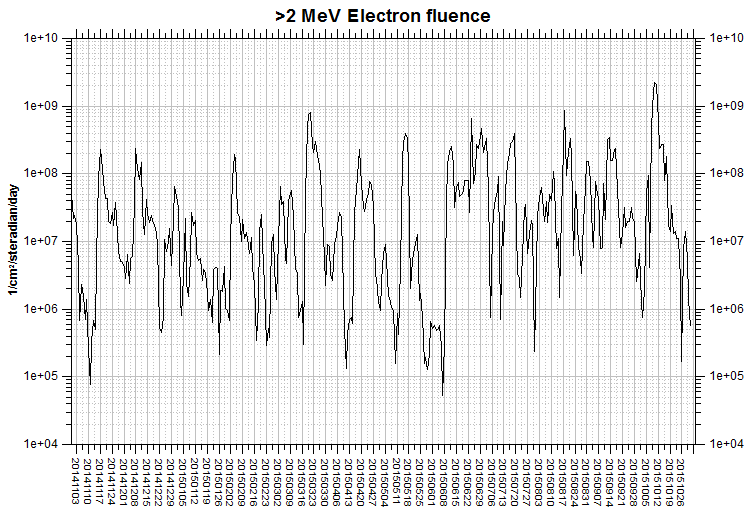 The 90 day 10.7 flux at 1 AU was 103.9. The Potsdam WDC planetary A index was 5 (STAR Ap - based on the mean of three hour interval ap indices: 5.1). 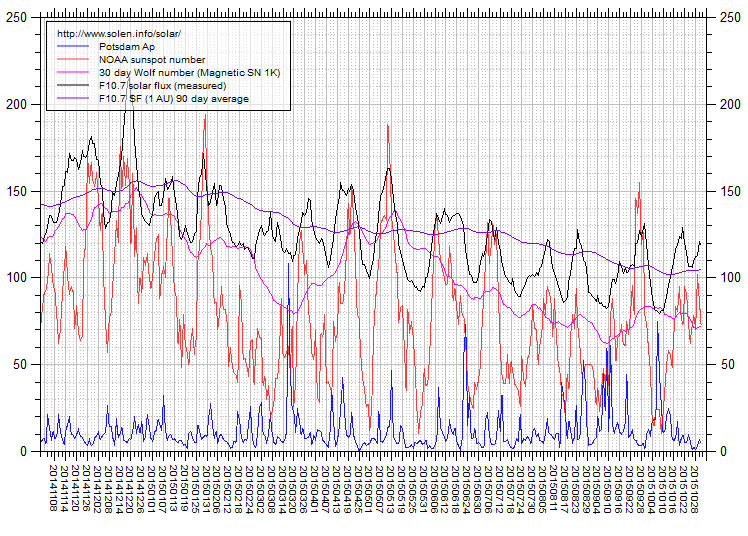 Three hour interval K indices: 11201222 (planetary), 10202331 (Boulder). 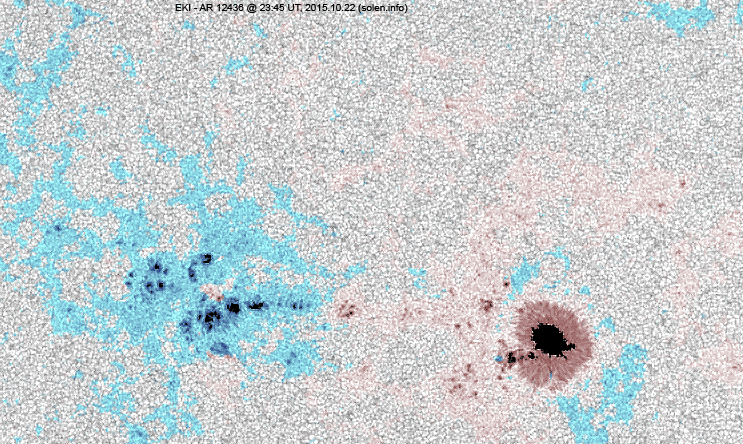 At the time of counting spots (see image time), spots were observed in 9 active regions using 2K resolution (SN: 210) and 8 active regions using 1K resolution (SN: 140) SDO images on the visible solar disk. 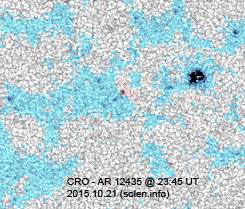 Region 12434 [S09W47] decayed slowly after the long duration event. Region 12435 [S14W06] was quiet and stable. Region 12436 [N08E06] gained spots with the trailing penumbrae fragmenting. The region has minor polarity intermixing. Region 12437 [S19E17] was quiet and stable. 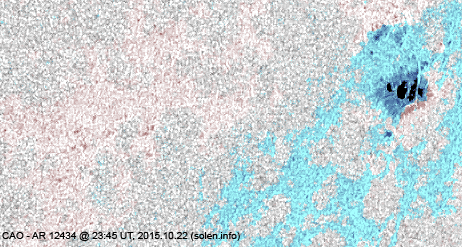 New region 12438 [S18W23] emerged on October 21 and was numbered by SWPC the next day. New region 12439 [N17E78] rotaated into view. S4835 [N21W07] was quiet and stable. New region S4841 [N00E16] emerged with a small spot. 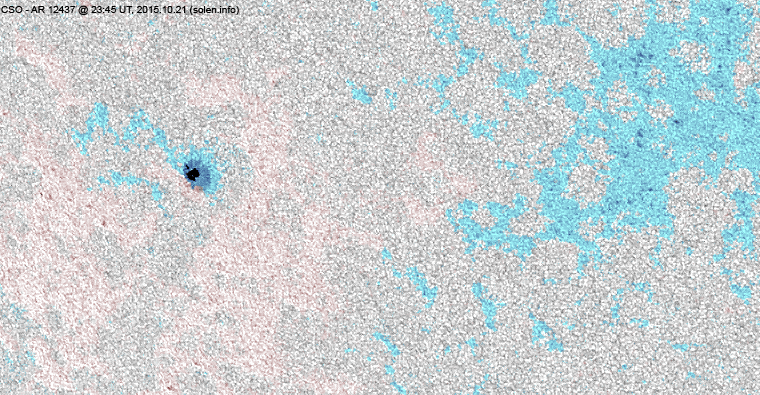 New region S4842 [S23W53] was observed with tiny spots. 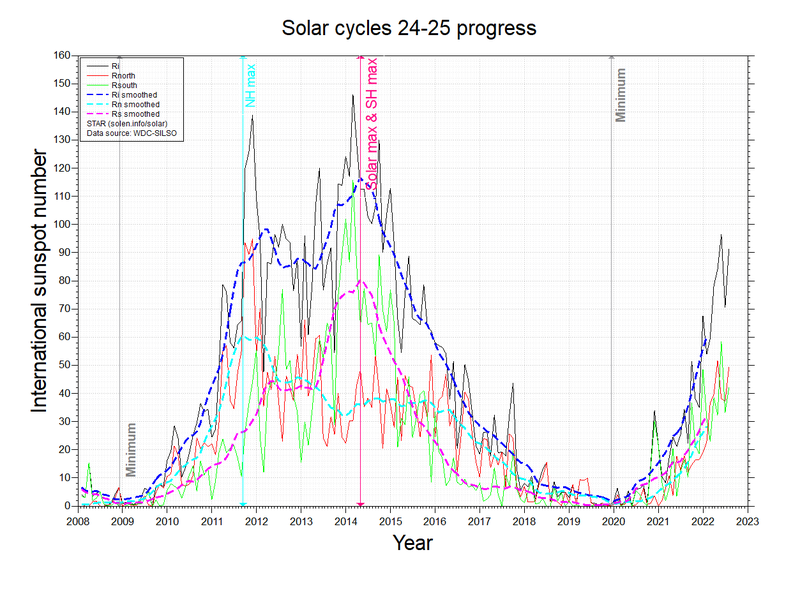 October 20-21: No obviously Earth directed CMEs were observed in available LASCO imagery. 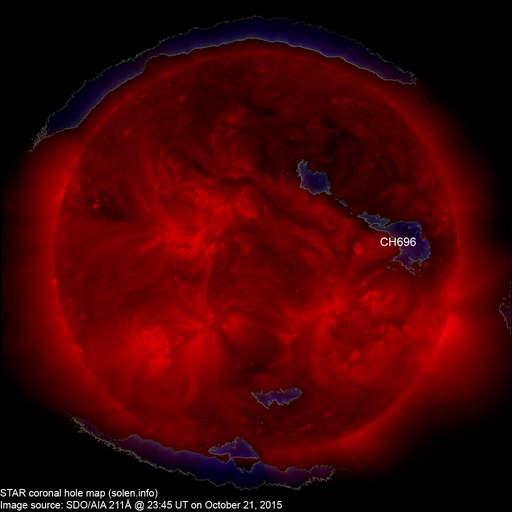 No coronal holes are currently near or approaching Earth facing positions. The geomagnetic field is expected to be quiet to unsettled on October 23 and most of October 24. The CME observed on October 22 could cause unsettled to minor storm conditions during the latter half of October 24 and on October 25. Quiet conditions are likely on October 26-27.